ABBOTT PARK, Ill., Aug. 18, 2014 /PRNewswire/ -- Abbott (NYSE: ABT) and the United States Department of Defense today announced a collaboration with the intent to develop portable blood tests to help evaluate potential concussions, also called mild traumatic brain injuries (TBIs). 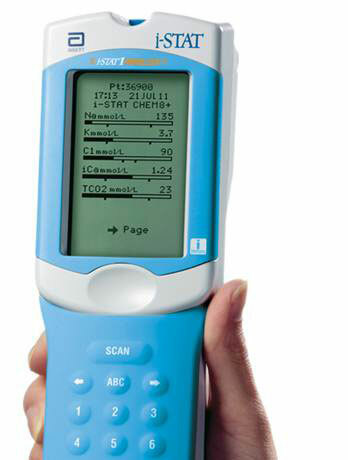 As part of a multi-phased approach, the tests would be developed for Abbott's i-STAT® System, a handheld, diagnostic analyzer that is currently used for other point-of-care testing, including among military service members. Concussions are a significant health concern for military service members. With the development of new tests, physicians could use the information to positively impact the care of people with a suspected concussion. "The quick and accurate diagnosis of a concussion is critical so that soldiers who are affected--whether on the battlefield or not--can be removed from duty to recover and to prevent further injury," said Colonel Dallas C. Hack, M.D., Brain Health Coordinator, United States Army Medical Research and Materiel Command. "The Department of Defense collaboration with Abbott represents a major initiative to help improve efforts to understand this complex injury and care for wounded warriors suffering from this condition." "Medical advances are needed to help more quickly assess concussions. The collaboration between Abbott and the Department of Defense is an important step in ensuring that military service members, and ultimately civilians, receive proper evaluation," said Beth McQuiston, M.D., a board certified neurologist and medical director, Diagnostics, Abbott. "These new tests could open the door to many possibilities for evaluating concussions and helping clinicians optimize care and outcomes." Abbott Point of Care (www.abbottpointofcare.com) is headquartered in Princeton, N.J., and develops, manufactures and markets critical medical diagnostic and data management products for rapid blood analysis. The company's premier product is the i-STAT, a market-leading handheld blood analyzer capable of performing a panel of commonly ordered blood tests on two or three drops of blood at the patient's side. Department of Defense worldwide numbers for TBI. Defense and Veterans Brain Injury Center. Website: https://dvbic.dcoe.mil/dod-worldwide-numbers-tbi. Accessed Aug. 12, 2014. Lee H, Wintermark M, Gean AD, et al. Focal lesions in acute mild traumatic brain injury and neurocognitive outcome: CT versus 3T MRI. Journal of Neurotrauma. 2008; 25:1049–1056. Kochanek PM, Bergerb RP, Bayıra HI, et. al. Biomarkers of primary and evolving damage in traumatic and ischemic brain injury: Diagnosis, prognosis, probing mechanisms, and therapeutic decision making. Current Opinion in Critical Care. 2008; 14:135–141. Injury Prevention and control: Traumatic brain injury in the United States. Fact sheet. Centers for Disease Control and Prevention. Website: www.cdc.gov/traumaticbraininjury/get_the_facts.html. Accessed March 13, 2014. Information provided to Abbott by the U.S. Department of Defense. Represents data for traumatic brain injuries from 2000 through 2011.